Tacoma's blighted billboard battle continues with the above example. Still obvious that Clear Channel doesn't care about the City of Destiny our new City Manager just declared that we don't care about enforcing our own codes with regards to removal of non-conforming billboards. Still, when it comes to public safety it seems we still have recourse in reporting violations. Pretty sure if that vinyl wrap blows off onto a car zooming by on I-705 someone could get hurt and Clear Channel could get sued. The link below will send an email with a subject and message already written to TacomaCares@CityofTacoma.org (you can also call 253-591-5001) to report this blighted and dangerous billboard. Just sign your name with your address and phone number at the bottom and send it off. Let's make Clear Channel clean up every billboard and make it too expensive to do business here on these clearly difficult to maintain forms of advertising. by CaptainBritton on 3/13/2012 @ 7:58am I will begin the hunt today...With more organized billboard hunts to come! 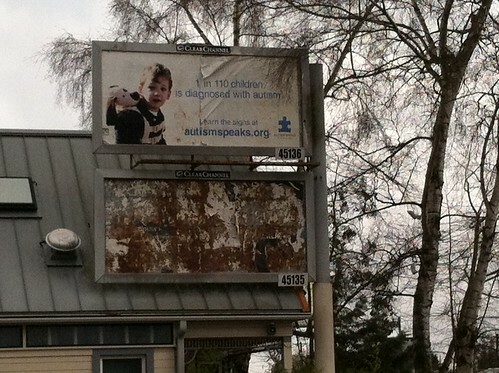 by cisserosmiley on 3/13/2012 @ 8:01am Is the blight the billboard OR the building behind it? by Erik on 3/13/2012 @ 8:11am Great post Kevin...and the first one after the March 1, 2012 deadline requiring non-conforming billboards to be removed. 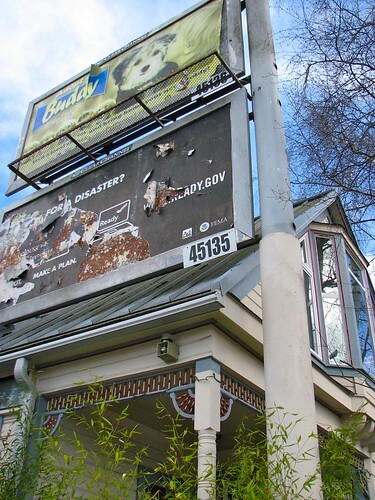 The city's failure to enforce the billboard law on the books, which took a year to craft through the public process, undermines all efforts to address blight in the city. I am going drive on 6th ave and then send in my report to the city. by KevinFreitas on 3/13/2012 @ 8:56am @Britton, @Erik: Post your pics here too and I'm happy to help pre-craft more code violation emails. by jenyum on 3/13/2012 @ 10:47am Sent my email! I need to take a fresh picture of the double billboard at the 7-11 at 6th and Alder. by NorthEndJustin on 3/13/2012 @ 11:54pm Email Sent! by NorthEndDinerDude! on 3/14/2012 @ 7:06pm I have billboard pics too! by jenyum on 3/15/2012 @ 10:35am I am sick of this thing. Somewhere in your series there are several photos of it taken over several months. Last time I complained to the city they put up a fresh PSA which promptly began to fall apart all over again. No one has paid to advertise on these two billboards in years. They have no value to clear channel. They need to go. Kevin, if you'd create an email form for this one I'll pass around the link. The billboard numbers are 45135 and 45136 and they overlook the 7-11 parking lot at the corner of 6th and Alder. by CaptainBritton on 3/15/2012 @ 10:37am That is the ugliest billboard in town...Except the Haida-esque Salmon painted on it's base. by CaptainBritton on 3/15/2012 @ 10:39am These are issues we can complain about...This makes nearly every billboard in town a target. f. Any sign that has been discontinued for a period of 90 days, shall be presumed abandoned and must be removed. by jenyum on 3/15/2012 @ 10:52am Found the old post with pictures. I don't think this billboard has ever had it's own official "hey clear channel clean up your crap" post. I think it needs to. Can we have it for Part 20? Here is the first photo taken on March 19th of 2011. In four days, it will be a year of documented, ongoing blight. by KevinFreitas on 3/15/2012 @ 10:57am Consider it part 20 if I may use your photos. It'll come with it's own email link tomorrow as well. Thanks @Jen and everyone! by jenyum on 3/15/2012 @ 11:00am Any pictures of ugly billboards are yours to have, sir. That last photo came from RR's photo stream. I'm sure he won't mind. 1. Billboards which are non conforming because of location. These billboards will be non-conforming regardless of how well the sign is maintained. 2. 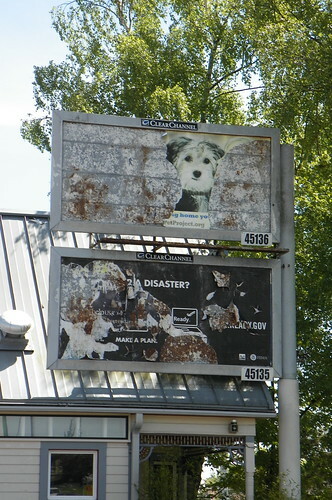 Billboards which are properly located but which are non-conforming because their condition is not per code or seem to be abandoned. 3. Billboards which are properly located and properly maintained. It would be useful to know which category the posted billboard pictures fall into. Jen had a good map in another thread quite awhile ago. Still it would be useful to know w/regard to every picture if the nonconformance is location and/or condition related. As you can see from the photos, these billboards are blighted in a more basic way, they are falling apart and have been abandoned. There should be no reason why the city cannot enforce that part of the code, or the part requiring that billboards be sound and have covered backs. After 90 days, the code says the billboards cannot be re-established. The billboards at 6th and Alder are also non-conforming due to their location, but that is a separate issue. by fredo on 3/15/2012 @ 11:36am Thanks Jen. I'm pretty sure that all the billboards which utilize vinyl stretched material are out of conformance. Pretty sure the signs have to be painted or pasted with paper Can't remember exactly how this is covered in the code, but those enormous sheets of vinyl aren't supposed to be up there in the first place, as I recall. Please correct me if this is wrong. by fredo on 3/15/2012 @ 12:06pm How about assembling a master listing of ALL advertisers, and ALL public service providers who are using the non-conforming billboards? This could be provided in speadsheet form complete with advertisers office phone, non-conforming location, clear channel sign number, and advertisers mailing and email addresses. This would be useful if people wanted to launch a grassroots effort to get the sign utilizers to cooperate with our efforts. yes or no? by jenyum on 3/15/2012 @ 12:08pm Fredo, re: degree of flimsiness of the signs. I can't find that in the code, as adopted this past August. (yikes) I could swear it was in there when I looked at the proposed wording in the spring. expense of the property owner, sign owner, or permitee. It seems Clear Channel will try to get away with absolutely anything they can, including switching to these awful vinyl stretch numbers because no one has explicitly said they can't. I think we need another amendment. At any rate, the vinyl signs which are hung on the billboard faces are temporary placements because they are not permanent. Therefore they are required to be "securely fastened and positioned in a place so as not to constitute a hazard." Clearly, a vinyl sign which is flapping in the breeze has not been "securely fastened." by Erik on 3/15/2012 @ 1:33pm Thanks for the cite Jenyum. A great many of the billboards in Tacoma appear to be in significant violation of the painted and/or debris part of the code. by CaptainBritton on 3/15/2012 @ 1:44pm Good work people!!! Nearly all of the single-sided ones are guilty of the "exposed back" portion also. When Tacoma tried to enforce their sign code banning billboards in 2007 Clear Channel sued the City and the matter went to Federal Court. Rather than spending years in court and wasting taxpayer money on an uphill battle the City made what was probably a prudent decision and agreed to a settlement. The settlement agreement was approved unanimously by the City Council (9-0) and it was blessed by the presiding US District Judge Benjamin Settle (not a pun) and was executed by Tacoma and Clear Channel. The Tacoma Council then heard an earful from the public who opposed the City’s agreement to allow Clear Channel to remove old vinyl billboards in exchange for digital boards and got cold feet. So the city decided to pass a sign code which would make billboards non-conforming and force Clear Channel to remove their signs by March 1st 2012. The problem is that the sign code Tacoma passed is in direct violation of the agreement they signed which provided vested rights to all of Clear Channel’s signs (which made all of their signs conforming and legal) AND required the City to compensate Clear Channel at fair market value for any signs the City wanted removed. Then the City filed suit in Pierce County Court to have the Settlement Agreement invalidated so that they could enforce their new code. Unfortunately, since the Settlement Agreement settled a Federal Court case the matter was moved back to the US District Court and is now being presided over by Judge Settle the same judge that approved the original Settlement Agreement. Clear Channel then filed a Motion To Dismiss Tacoma’s suit. The judge did not throw out Tacoma’s case but did issue an ORDER GRANTING IN PART AND DENYING IN PART DEFENDANT’S MOTION TO DISMISS which was a severe blow to Tacoma’s efforts to invalidate the settlement. This is the real reason (combined with the significant legal costs cited by your new City Manager that Tacoma can’t enforce its new sign code. Enforcing the code would violate the terms of the settlement agreement which is still valid until the US District Court Judge decides to reverse course and invalidate the Settlement Agreement. Enforcing the code would put Tacoma at even greater legal risk since it would be in direct conflict with the settlement which resolved Clear Channel’s original lawsuit. This puts Tacoma in a really difficult position because even if the city decides to continue forth with its legal action and wins they still have to go back and fight Clear Channel’s original lawsuit. Clear Channel is a Republican backed mega corporation (Hello Mitt Romney) and has repeatedly shown that it will tie municipalities up for years in court while they continue to keep billboards in the ground and collect revenue to finance their lawsuits and appeals while cities burn through taxpayer dollars and eventually give up or settle (like Tacoma did the first time). I have been following this case with interest as we went through this same scenario several years ago in Tukwila. State legal precedent is skewed heavily in the favor of the Billboard companies. Two cities (Federal Way and Spokane) have fought this battle previously and in both cases it was determined that amortization is not just compensation and the billboard companies kept their signs. This is why Tukwila chose to work with Clear Channel and came up with a solution which removed 5 oldstyle billboards in exchange for 1 new digital billboard. The city did a cost/benefit analysis of the situation and quickly determined that fighting Clear Channel for years was a bad investment of City funds especially in light of the fact that Clear Channel would likely prevail. To their credit the City severely restricted the locations where the digital billboards could be built limiting them to two small industrial/commercial areas with no nearby residential areas. I am not a fan of billboards in general but the upside is that the older signs are being removed from a less appropriate redevelopment area. In my mind the solution was the least worst case scenario. Based on past experience my best guess is that Tacoma will either settle the case or the Judge will uphold the Settlement Agreement and T-Town South will be stuck with all the existing signs unless the City goes back and tries to make another trade deal with Clear Channel. The Tacoma City Council really shot themselves in the foot. They put themselves in a no-win situation by passing a new sign code before finding out if they could get out of their agreement. I wish you folks the best of luck. by fredo on 3/15/2012 @ 4:32pm The settlement agreement did deal with the old billboards as you point out. But it introduced a new variant that the public had no knowledge of: the digital billboard. The nine members of the council (who I have mentioned previously) agreed to very unfavorable terms presented in an agreement written by the other party (Clear Channel) without allowing their own constituents an opportunity to weigh in. There was no reason whatsoever for rushing to judgement and the entire matter should have been tabled (withdrawn from the agenda) for later consideration. IMO the voters should have petitioned to have all 9 council members recalled from office for this offense. Very poor handling of the matter by people who are supposed to be representing OUR interests. by Erik on 3/15/2012 @ 6:39pm Cities can ban billboards in their entirety if they choose. Tacoma is only requiring two thirds of the existing billboards to be removed. Yes, the "settlement agreement" certainly should not have been rushed on the agenda and signed by the council and may take some time, effort and money to address. by Jesse on 3/15/2012 @ 7:05pm The settlement agreement wasn't signed by Clear Channel for a very long time. They only signed it when the City of Tacoma informed them that they are backing out. That means the contract (settlement agreement) is void-able. I know a lot of attorneys. They all seem to think a court would find in favor of the City of Tacoma on this matter. Heh... I disagree. They went into a city planning topic taking the advise of professional city planners and attorneys... I am sure they were misguided by these people stating that this can't be battled and won. Please remember the inadequacies (... and laziness?) of Liz Pauli and company. The only advise I have ever read coming from this department always suggests the city take the easy road --- for their legal team. by fredo on 3/15/2012 @ 7:53pm The settlement agreement gave Clear Channel the right to install digital billboards in town. Not only that, it gave them the sole right to install digital billboards. In other words it gave Clear Channel a monopoly. Not only that it gave Clear Channel these rights in perpetuity...that means forever. In short, it granted a monopoloy to a company to install digital billboards that could never be restricted in any way and could never be struck down. And the councilmembers decided this was something that had to be signed right away with no public input? I'm no attorney but I've read the entire "agreement" and there is practically nothing there of value to the city. Lots of value to Clear Channel. As soon as our council signed off on the agreement clear channel had our city by the balls. How ALL NINE council members were able to jointly sell our city future down the river with barely a minutes reflection is quite astounding. Jesse, your right, Liz Pauli should have warned them that signing this agreement was basically signing a pact with the devil. There should have been weeks, even months of public hearings before an agreement was signed. It's like Obamacare, it had to be signed before anybody had even read it. From Olivia Lippens + Clear Channel Outdoor's Legacy in Tacoma or HEY CLEAR CHANNEL CLEAN UP YOUR CRAP!